I went to a Harris Teeter grocery this morning and stopped at the Starbucks Coffee shop. They are recycling the coffee grounds by placing them in the bags the coffee came in and offering them to customers. All I did was take a minute to ask. This shows that people are concerned and want action. Starbucks has a corporate vision for recycling and has taken some concrete steps, but many decisions are made at the local level for various reasons. 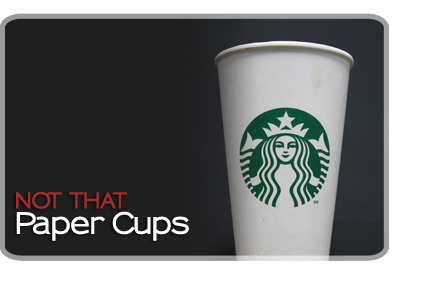 Remember, most paper cups, including Starbucks are not being recycled due to the plastic liners and lack of municipal processing. When you place a paper cup in most recycling bins you are making things worse. Most plastic lids are recyclable. Managing the environmental impacts of our business requires collaboration, innovation, and ongoing improvements. We have made substantial progress to reduce the impact of wastes generated in our stores through improved packaging design guidelines, offering reusable cups, advocating for local recycling infrastructure and expanding our customer-facing and behind-the-counter recycling practices. Recycling seems like a simple, straightforward initiative but it’s actually quite challenging. Our customers’ ability to recycle our cups, whether at home, at work, in public spaces or in our stores, is dependent upon multiple factors, including local government policies and access to recycling markets such as paper mills and plastic processors. Some communities readily recycle our paper and plastic cups, but with operations in 70 countries, Starbucks faces a patchwork of recycling infrastructure and market conditions. Additionally, in many of our stores landlords control the waste collection and decide whether or not they want to provide recycling. These challenges require recycling programs be customized to each store and market and may limit our ability to offer recycling in some stores. Not only are there municipal barriers to successful recycling in many cities, but it takes significant changes in behavior to get it right. A few non-recyclable items in a recycle bin can render the entire bag unrecyclable to the hauler. For recycling to be successful, local municipalities, landlords, customers, baristas, and even adjacent businesses all have to work together to keep recyclable materials out of the landfill and non-recyclable materials out of recycling bins.